Nice! I loved the 1987 series Captain Power & the Soldiers of the Future. It was one of the first attempts to actually interactivity between the toys and episodes of the series. Heck, I even snagged a copy of the complete series on DVD a year or so ago. 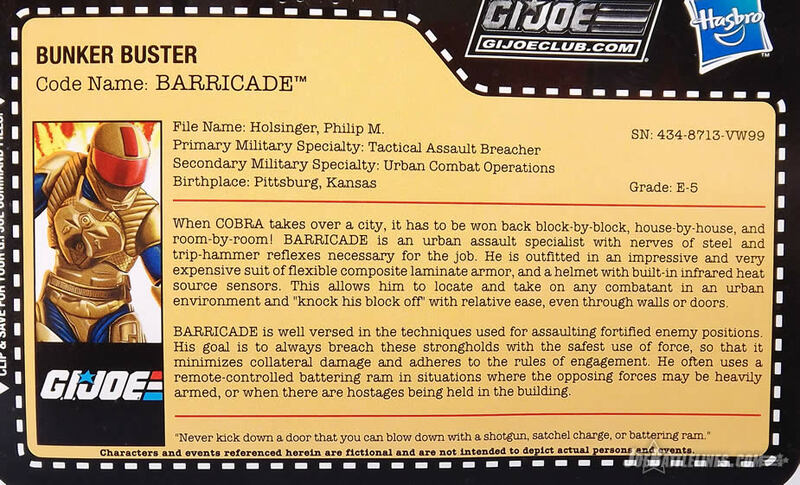 However, for this reviews, we’re going to be talking about an entirely different character that debuted a few years later in 1992, the “Bunker Buster” Barricade. This is what happens when I let Chris start the text for the reviews. Tangents abound. Barricade was the G.I. 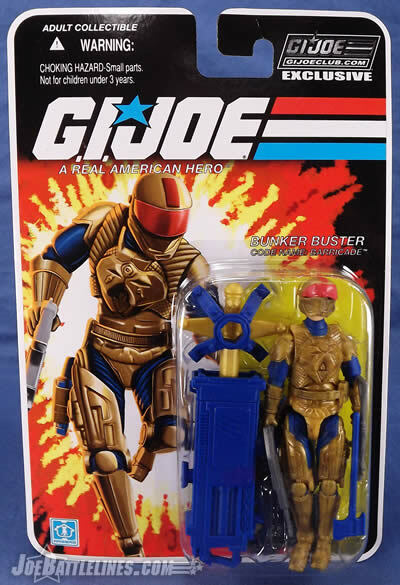 Joe team’s new “bunker buster”, but behind the scenes it’s likely he was one of the figures Hasbro designed to mimic other toy lines’ characters so people wouldn’t have to leave G.I. Joe. In this case the aforementioned Captain Power. The result is only marginally effective. While his PMS (Primary Military Specialty! I know what you were thinking Freddie!) was decent, his execution fell short from his garish colors that aren’t even remotely urban-tactical, unless you’re fighting Bio-Dreads in the rubble of New York City. Then coloration really isn’t relevant. But I digress. The build for Barricade is passable, but not overly inspired. While not my first choice, I actually don’t mind the Accelerator Suit body, but I just wish they would have done more to decorate it. 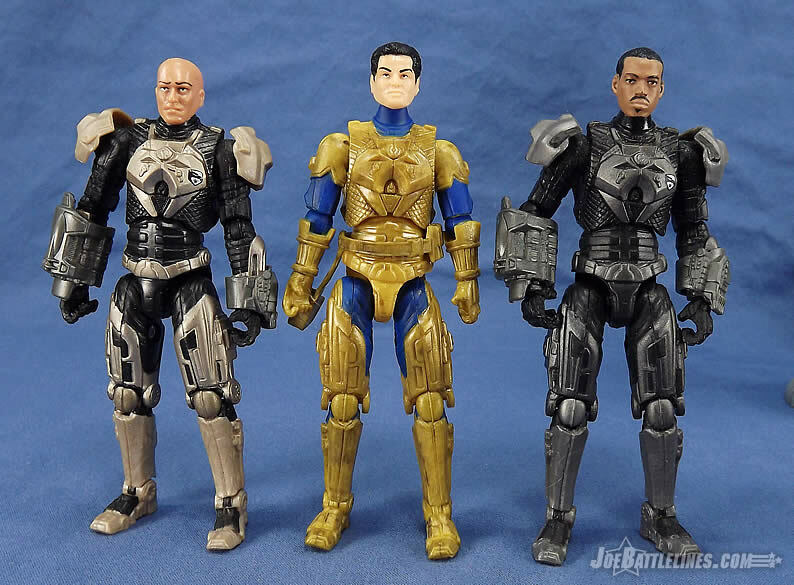 It’s funny but when I look at the original 1992 Barricade figure, I don’t see the Accelerator Suit so much as I see the Reactive Armor from Rise of Cobra. 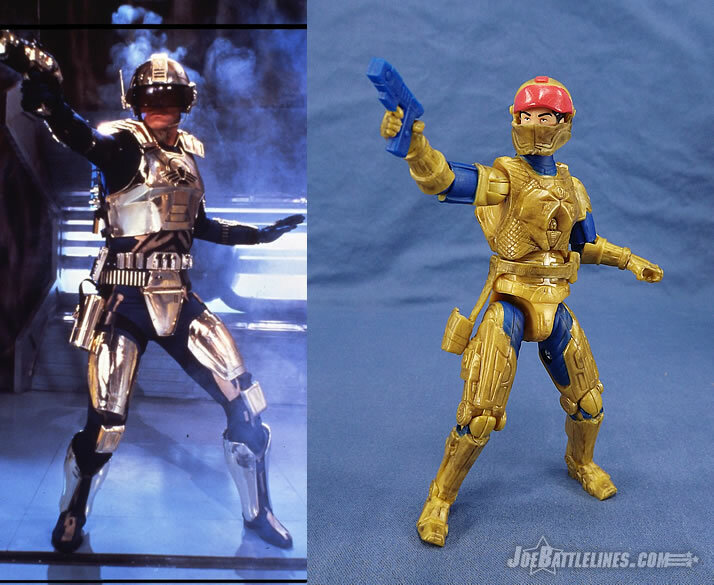 The original ARAH Barricade’s uniform was meant to simulate hi-tech armor and I’ve always seen it more akin to what the Storm Troopers wore in the Star Wars franchise than a powered exo-suit. In other words, his vintage uniform always felt like high tech armored panels over some type of Kevlar bodysuit—more agile and flexible than outright powerful. While the Accelerator Suit body is a good choice, I almost think the Reactive Armor would have been an even better choice! Agreed. We’ve never really had the opportunity to see that sculpt painted or even molded in more vibrant colors and there wouldn’t have been any need to swap out the figure’s arms. If anything, the Accelerator Suit makes the figure look MORE like Captain Power! 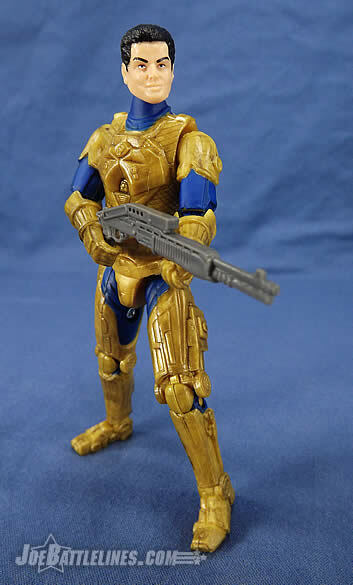 To prevent a straight-up reuse of the Accelerator Suit body, the GIJCC designers opted to swap out the figure’s arms with those of the 25th Anniversary Armored Cobra Commander figure. 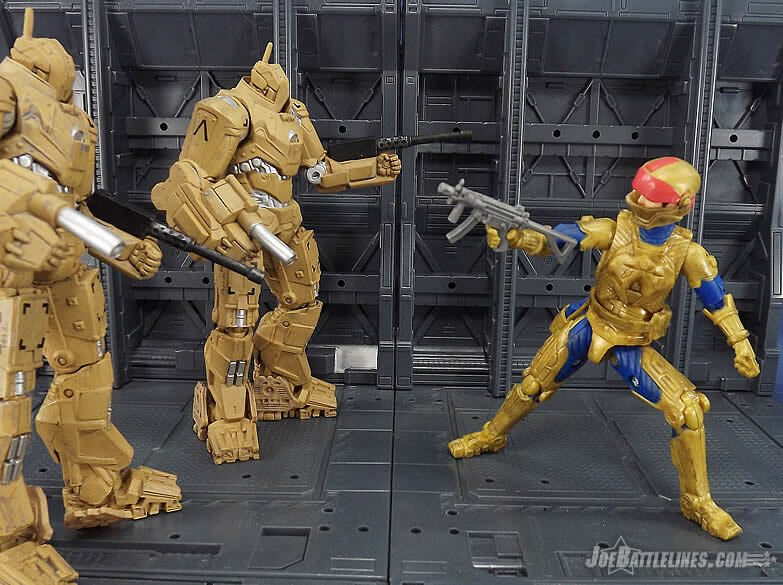 Visually, it’s not a bad choice although the 25th limbs are a bit shorter than those that came with the RoC body originally. The biggest issue with them is that there is a noticeable gap in the shoulders of the figure when viewed from behind. Seriously noticeable. I know that these figures are designed to essentially either be displayed on card or on a figure stand, but the odd fit of the arm-to-shoulder really is something unfortunate. It’s not a deal breaker but it’s really hard not to see once you’ve noticed it. Yup. The hands are also on the small side. I actually take more issue with the Chuckles head---aside from it not fitting the helmet (more on that below). 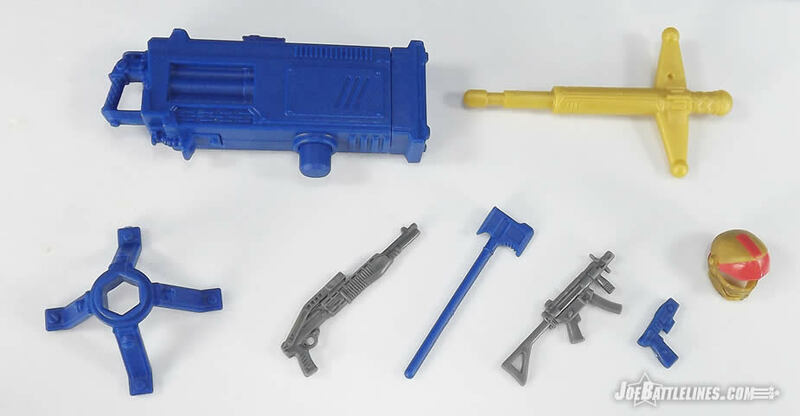 Anyone notice anything with Barricade’s head and the upcoming Bullhorn one? The hair styles are wrong. Barricade has his hair parted to the side, and Bullhorn has it styled swept back. But to be contrary, Barricade was given the hair that is swept back that would work for Bullhorn, and Bullhorn was given the head with the parted hair that would have worked for Barricade. Why does this matter? 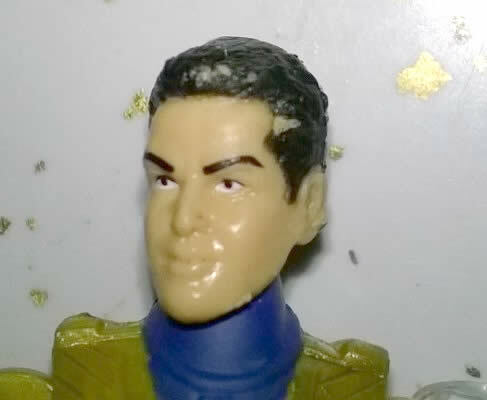 Because the Club often bends over backwards to emulate some of the less-than-ideal aspects that the vintage figures had to make the modern ones more “accurate”, but then they can’t see they have the wrong hair styles which are not at all accurate; yet they potentially have the heads that can fix this? And if the existing heads wouldn’t have worked swapped the other way, new ones should have been made instead of spending the cash on chunky spring-launched missile launchers and reusing the same heads over and over again for multiple characters. Chris, while I’m not as upset about the difference in hair styles as you, I do have to agree with your comment about giving figures new heads where possible. 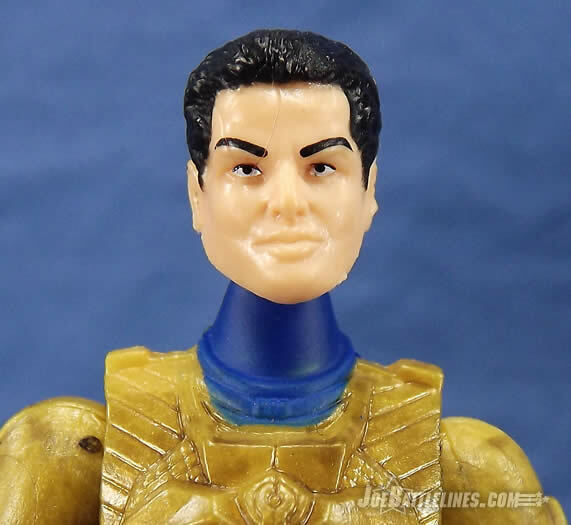 One of the best parts about the original ARAH line was that after 1982, for the most part characters had unique head sculpts. Sure, there were exceptions here and there but for the most part each character was given a unique identity with a unique countenance. My single biggest regret about the G.I. Joe line starting with the 25th Anniversary collection onward is that this practice wasn’t continued. 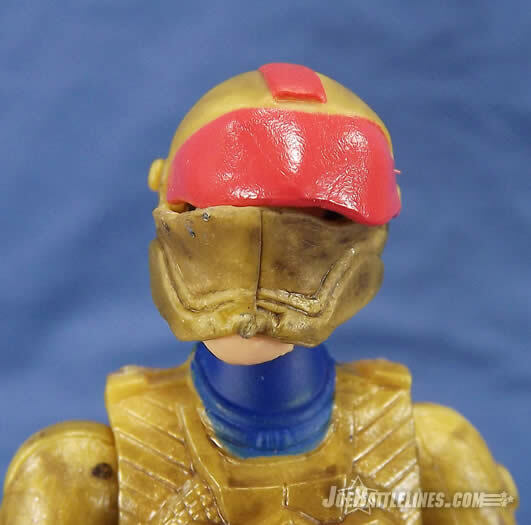 I think a bit part of why the GIJCC chose the head sculpt that they did was that they were stuck finding something that would fit inside the included helmet. Three words: Boss. Fight. Studios. They are action figure Viagra. And while the original Barricade was a great looking sculpt plagued with bad colors, but that was finally remedied by the V-3’s version which repainted him in realistic and tactical Anti-Venom Task Force colors. This would have been the version I would have preferred; or even urban camo as a modernization update. 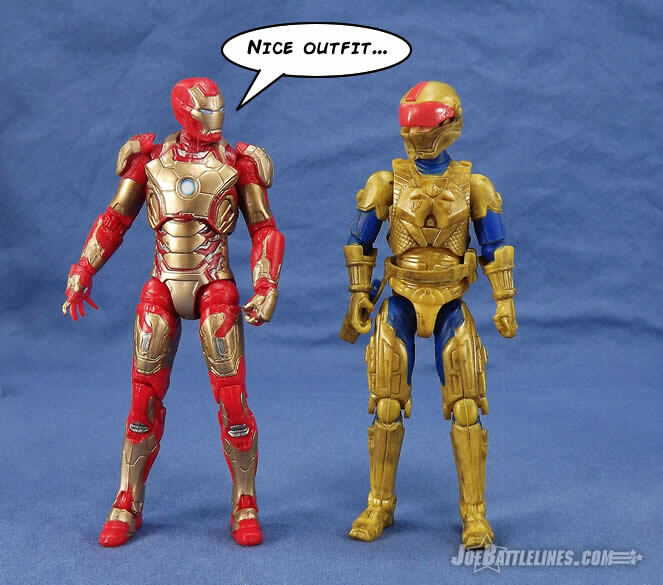 But once again, we get figures replicating the vintage aesthetics, no matter how bad they look to modern sensibilities not clouded through the rose colored glasses of tired nostalgia. The original figure came out in the early 1990’s—the age of neon! Everything was trending toward bright garish colors as well as shiny metallic looks when it came to anything high tech. The weathered look of the Star Wars era had faded and folks were looking for something different. 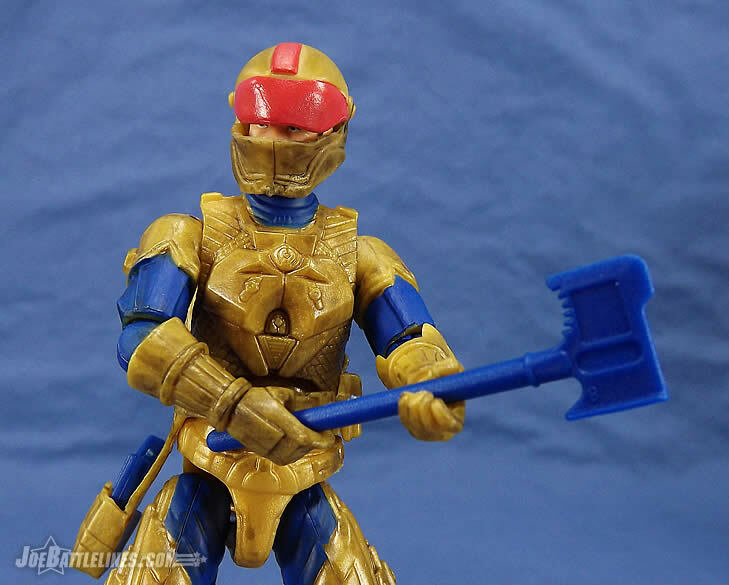 As such, I don’t have any problems with this color scheme aside from the fact that it really honestly makes me think of Captain Power. The shotgun seems fine for breeching, and the MP5 works well in close quarters. Not sure why he comes with a taser, unless it was an oversight by someone mistaking it for a firearm. The missile launcher is too big and impractical to really lug around, so that is a wash for me. 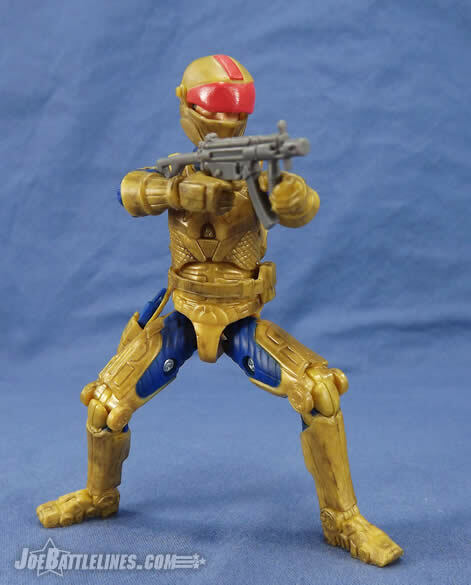 I’m fine with the kit on this figure; although I would have made one swap: The included missile launcher (also originally included with the RoC Accelerator Suit Duke figure) is a decent homage to the original but, for adult collectors, it’s not all that practical. 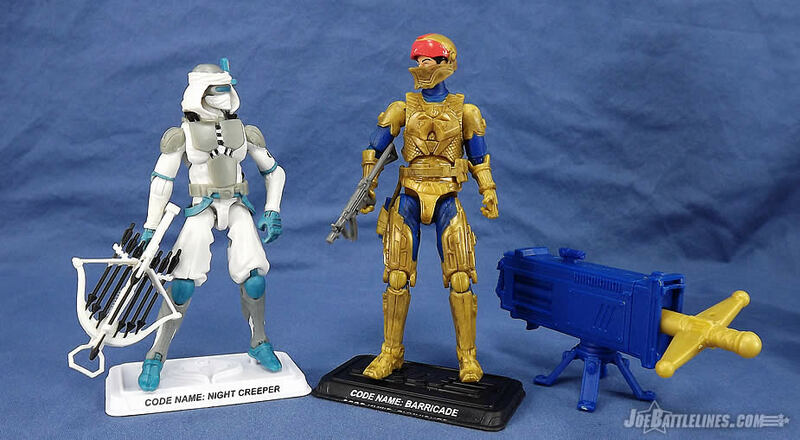 I understand the desire by the GIJCC to recreate the classic looks as closely as possible, but I’m almost wondering if instead of the rocket-firing launcher, we’d instead seen a reuse of the shield that came with the FSS Widescope figure two series back. 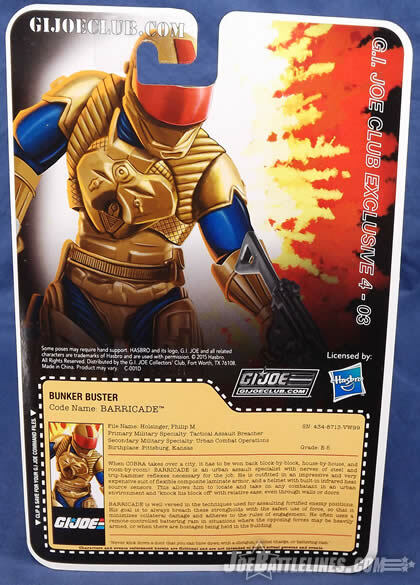 Equipping Barricade with a shield would strayed into 1988 Super Trooper territory but I think it would have also given the character a nice tactical update. Otherwise, I’m good. The only other issue for me was the helmet: Surprise, surprise, but it doesn’t fit! I had mistakenly thought it was a new sculpt helmet with a protruding visor, as that’s what it looked like in the package. But when you open it, it’s actually a severely warped Accelerator Suit helmet that doesn’t fit on the head, so the helmet is bent and twisted in ways it was not designed to handle. It’s also too short to cover Barricade’s face, so the visor is actually at the top of his head nowhere near his eyes. Again, this is where a newly tooled head and helmet would have added to this figure by at least offering something new. I’m with you on the helmet—it’s not a great fit. 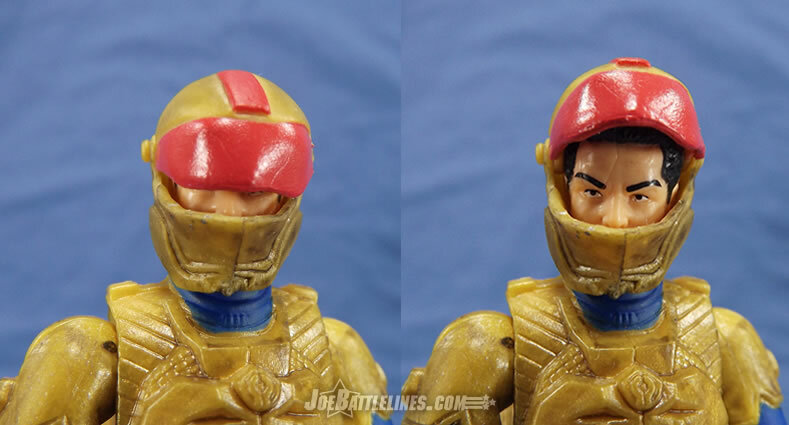 Much like I discovered with the FSS Cesspool, this helmet was chosen completely for form over function. On my figure it sits on the head way too tight meaning that I have to remove the figure’s head in order to be able to remove the helmet. However, I’m hard-pressed to come up with another alternative that doesn’t require new tooling, something that is somewhat prohibitive in a line with this low of a production run. 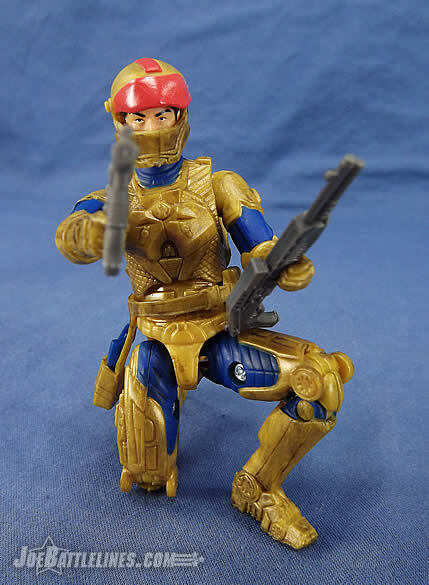 I tried swapping the vintage helmet on to the figure as I did with Cesspool but it was way too large. The only real alternatives are pilot’s helmets from the line but not one of those looked right either. As such, I’m going to have to search elsewhere to find a good helmet for ole Barricade. So Chris, what are your closing thoughts? I’m fairly disappointed in Barricade. I think the end result we have here is an overpriced and unimpressive figure that lacks all the potential he could have had if a little more thought was given to his build. But on the other hand, this is a Fourth Tier character who finally earned his day in the sun. That is something worthwhile, but it would have meant a lot more if some money was spent on new parts to make him at least look unique, instead of spending it on an oversized missile launcher that many of us won’t ever use. 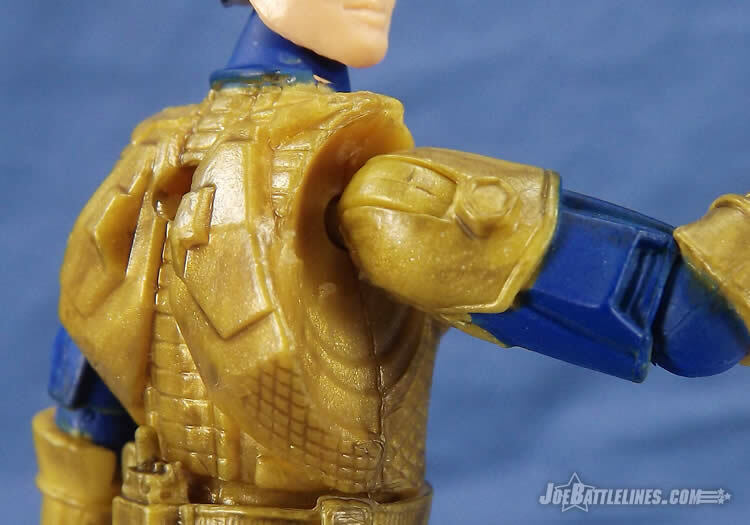 When we factor in the ill-fitting parts, colors, and lack of creative vison, I can’t recommend this figure---not when I’ve seen fan-made customs that overshoot this by a mile. 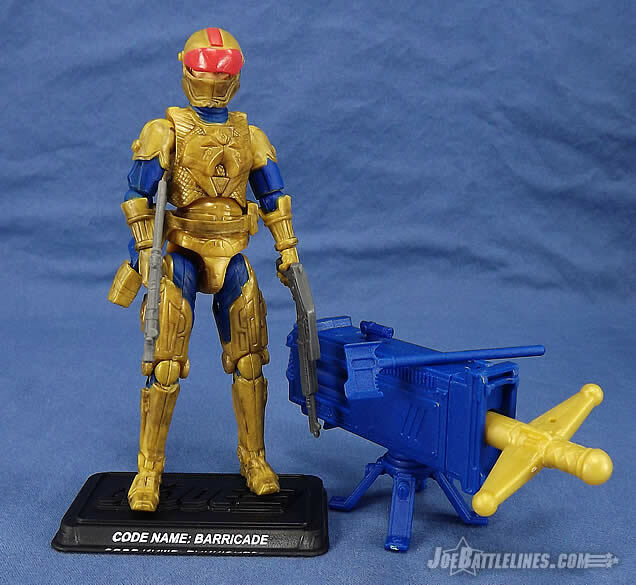 At the end of the day, is Barricade a worthy addition to an ARAH generation 3 collection? I’ll be honest—this is a hard question for me to answer. Given his limited appearances in the comics and virtual omission from the animation, I don’t have any nostalgic attachment to this character. As such, I’m going to judge him solely for how he arrived on the card. Barricade is a visually interesting figure and I like the bold contrast that his color scheme offers. I’d be a lot happier with the figure if his helmet didn’t feel like it was three sizes too small or if his arms were a bit more proportionate. However, I’m a sucker for the design of Accelerator Suit armor (not so much its cinematic execution) so I’m “mostly happy” with him. Do I think he could be better? Absolutely but he’s far from the worst piece that the Club has ever put out. Late-era ARAH fans should be happy that at least one member of the DEF has seen a generation 3 update. I just wish I could find him a better helmet. Of course, that’s just this Joe fan’s opinion. 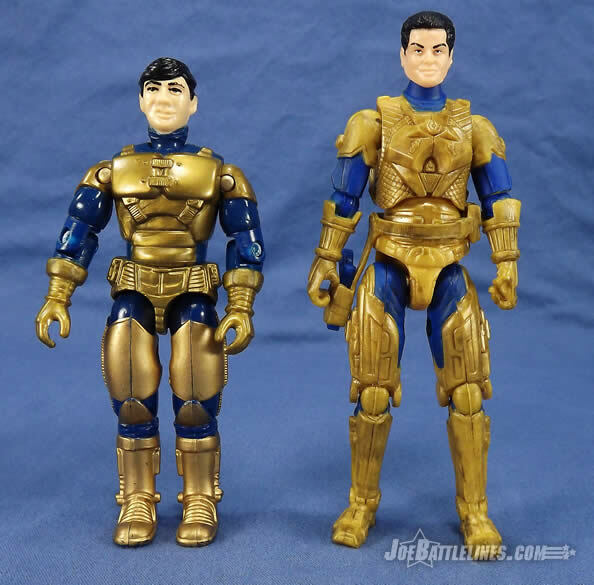 The Bottom Line: Not a perfect figure but a decent update to a late ARAH era character. Be prepared to be disappointed with his helmet, however.